Brighton gets ready for festival! 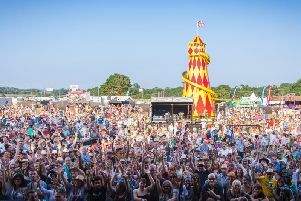 Brighton Festival this year enters its second half-century after the huge success of last year’s 50th anniversary outing. Brighton Festival 2017 – the largest annual, curated multi-arts festival in England – runs from May 6-28 with recording artist, poet, playwright and novelist Kate Tempest as guest director. Kate’s programme celebrates what she calls the “Everyday Epic – art that helps us connect to ourselves and others, explores our individual stories and differences and encourages audiences to take a walk in someone else’s shoes”. In charge for his ninth festival, Andrew Comben, chief executive of Brighton Dome & Brighton Festival, said: “Last year we had record attendances and some of our best responses to commissioning that we have had. For the 50th festival, we tried to build on what we have done over the years but also on being responsive so that we could also be quite last minute. “Now we are looking to the next 50 years. We could have it both ways. Last year was our 50th festival and this year is our 50th anniversary, but we have chosen to look ahead, and that’s one of the reasons for choosing Kate as our guest director, someone who is consciously carrying on the torch from last year when Laurie Anderson was our guest director, someone who is still at the height of her powers but has been practising for all the time the festival has been around. She is really one of the doyens of new artistic experimentation, but she is handing on now to Kate, a woman who is still just 31 and who is already celebrated across a number of genres. One of the great things about Brighton Festival is that it reinvents itself every year, and that has been heightened slightly by the sense of anniversary we have had. It has also been highlighted by our political realities which hopefully will show in the programme, the 2016 divisionary politics and offensive communities fragmenting or not knowing each other at all. That’s something that Kate really wanted to address in this festival. I think culture can do great things. Culture can certainly attempt to bring our culture together. Also key, as ever, is the festival’s complex and thriving relationship with Brighton itself. Is it a festival that could happen anywhere else? Or is it very much about Brighton? “I would want to have my cake and eat it on that. It is both. We make sure that the festival is very specific about this place and is referencing the particular culture around here and the fact that we are working with a very specific landscape, whether that is on the Downs or Shoreham Harbour. In one sense, it is absolutely specific to what is happening here. “But the remarkable thing is that if you think back to 1966, leading up to the first festival in 1967, the city really got together and looked at itself and felt that arts and culture had a solution to a number of the problems that existed in the city, whether mods and rockers or that parts of the city that were down at heel and representing faded glory.